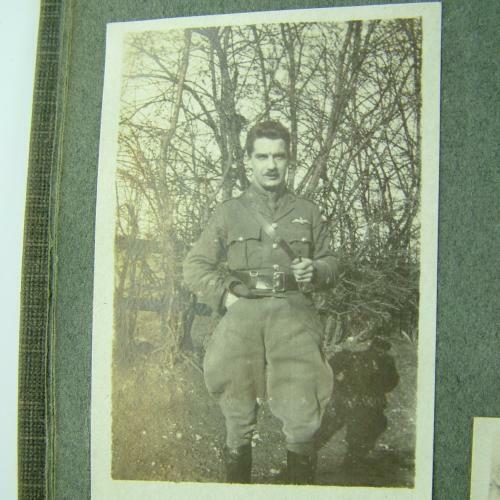 Small card backed photograph album with photos dating from the Great War. Images include soldiers in uniform, some family members, small snaps of an RFC officer, a pilot in flying kit (leather coat, full cowl helmet and gogglemask), a RFC Observer in uniform, RFC pilot with small child of a French family close to their aerodrome, crashed aircraft, general landscapes etc. Many of the photos are yellowed and some are blurry but a reasonable proportion of the military related ones are ok. Photo sizes vary from about 4 x 6cm to 6.5 x 10cm. There are about 89 photos of which 38 are military related. A few photos are missing and overall condition is fair. Stock code P21408.